It’s been way too long. We moved off the boat at the end of September last year, because we both went back to school. 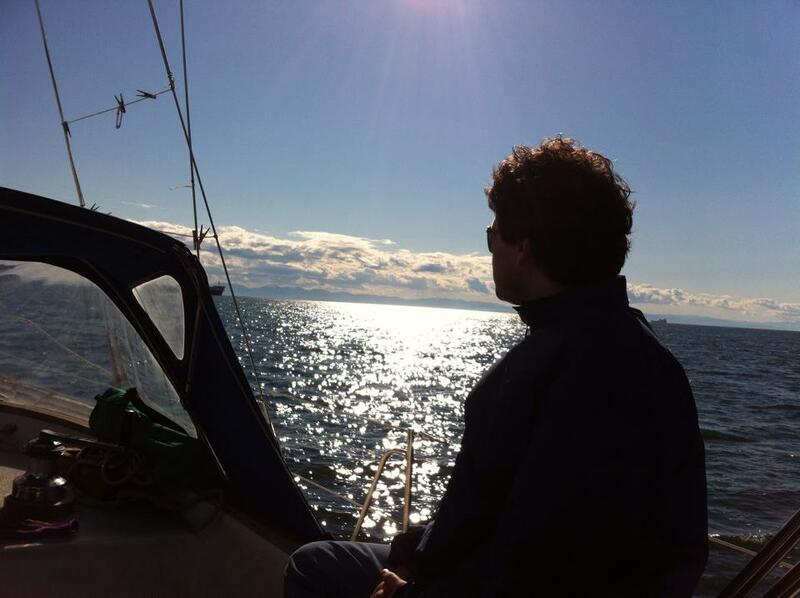 Living at anchor on a 27-foot boat and doing intensive academic degrees (and working!) is no easy trick. Especially since it started to rain and might not have let up until the spring. We still have Tomahawk (in fact, I took a friend out yesterday for a lovely day of sailing). Most of our adventures have been of the maintenance kind. We hauled it out in June for a bottom job – DIY and we scraped it down pretty much to the gelcoat, since we didn’t know what kind of paint was on it. Now it looks shiny and moves a lot faster, although things are already starting to grow on it. We may have to floss it soon… That’s using a piece of line to scrub the bottom from the deck, one person on either side, with a back-and-forth motion. I’m getting ready to start my research, which is about cruisers (surprise, surprise). Jason has been working on the little water buses and we are both gearing up for a new semester at school. The sailing season is coming to an end here, but we have lots of ideas for Tomahawk for next year. And hopefully we’ll still get a few nice days to enjoy the water this fall. 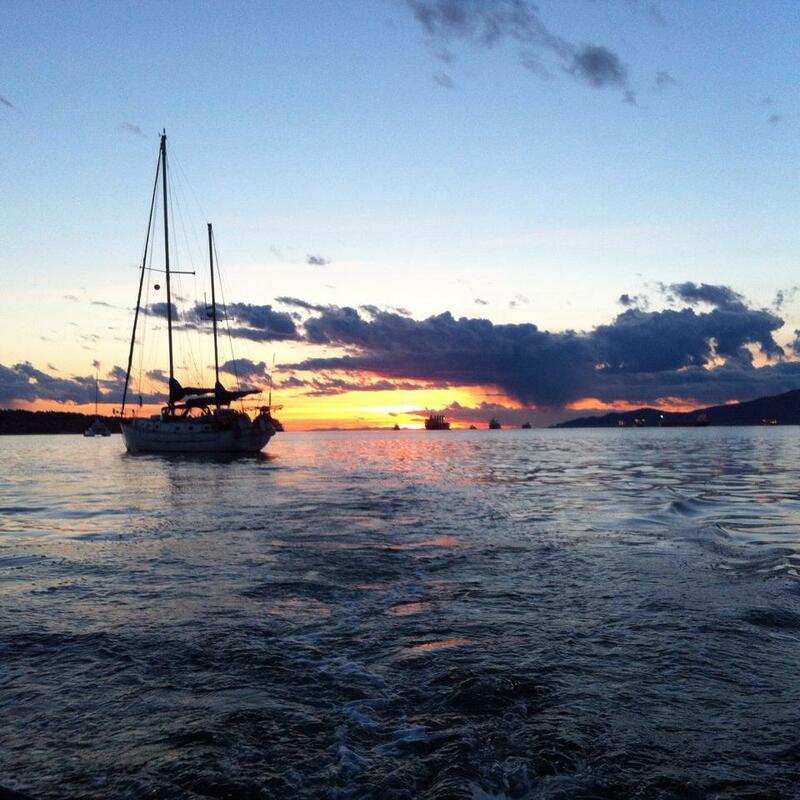 Our first few nights on Tomahawk were peaceful, despite some bouncing around out in English Bay. We were a bit wary rowing into shore when the waves picked up, but we found a place to lock our Walker Bay onto the beach and all was well. However, I found myself suffering from an inability to get into anything, even reading, while sitting on the boat. Jason rigged up a tarp for a sun shelter, but it flapped around at night making a ruckus. So that idea was scrapped. Most people have a proper Sunbrella cockpit shelter to keep the sun off. Bits of rigging make noise at night too, and not just on our own boat. We dubbed a neighbouring craft “Noisy Halyard” due to the pinging noise of the line slapping against the mast all day and night. We soon discovered that English Bay was making us irritable and exhausted. So we moved into False Creek. The silence and lack of motion were a welcome respite from the effort of the bay. We anchored next to the dock, so it takes us much less time to get to shore. Plus we can sleep at night. Back on July 1st, for our first night as liveaboards, we slept in the V-berth, a small cabin in the bow of the boat. If it was just me, I could probably sleep fine in there, but the two of us were way too cramped. Jason is also not as short as me and the weird angles made it extra confining. The boat cushions need replacing too. Musty smells added to our discomfort, so they had to go. Since then, we’ve converted the dinette to a berth (bed) and have been okay there. It’s a bit short for Jason and there isn’t much wiggle room for either of us. Luckily we like each other a lot and we have been settling in to a routine. We have been living on Tomahawk for a week now (which is a good excuse for the lack of posting). There are still a lot of things to do to get settled in, so we are busy: buying propane, hooking up a battery/electrical system, scraping and painting the bottom, cleaning inside and out, organizing our stuff into bins and compartments, etc. Lots of ups and downs, sometimes literally, especially on windy days! Soon I will post further updates about our various adventures before and after moving on board, such as refloating our friend Jamie’s boat Paramour and fitting everything into storage. Also, yesterday we were sort of trapped on the boat because our dinghy is hard to get into on a choppy bay. Today we plan to remedy this by buying a fender step to hang over Tomahawk’s side. If all goes well, I’ll be updating a bit more frequently again in the near future! At the end of the month, we plan to move aboard Tomahawk. We have so much left to do to get the boat ready and we continue to have obstacles thrown at us. Recently, our Zodiac got stolen. The person cut the ring off of where it was patched to the boat, leaving our lock on the dock. Luckily, we had just purchased a new Walker Bay hard shell tender. The new tender has a wheel in the back (stern), but it isn’t enough to carry it all the way from where we have it in storage down to the water. It’s several city blocks of sidewalks and pedestrians and traffic. But we don’t want to leave it at the public dock overnight after all our other negative experiences. Once we move onto the boat, we will be keeping it with us except for a few hours during the day. With a lock, it should be fine (knock on wood). We’ve also ordered a new outboard engine. It’s a 5hp Tohatsu with a five-year warranty. If we maintain it properly and run it regularly, it should give us lots of use and peace of mind. And it puts up the value of our boat for resale, especially if it’s still under warranty at the time. The Walker Bay would too, but we plan to keep that when we upgrade. Speaking of upgrading, we have started looking at bigger sailboats in the 35-40′ range. Last week, we took a trip to Nanaimo to check out a C&C Landfall 38 and a Hunter 35. In the morning before we got on the ferry, we visited a Catalina 36, the big sister of Tomahawk. All were appealing, but requests for advice led us to understand that we need an offshore boat, even though we don’t plan to go offshore for a few years. That eliminates the Catalina and the Hunter, which were both built for cruising in sheltered waters. People have crossed oceans in them, but people have done that in rowboats too. We would prefer something designed for that purpose. So within the next few weeks, we have to get or build some sort of cart for the dinghy, haul out Tomahawk to clean and repaint, take the old motor off and install the new one, and clean the boat inside. We also have to sort through our stuff to see what we will get rid of, put on the boat, and put in storage. So much to do, so little time! If we can’t do the haul out this month, we might have to beg a friend to let us sleep on their couch for a few days in July, so that we can get that all done. Tomahawk has officially belonged to us since last September, but our first sailing outing on our boat didn’t happen until April 21st. As usual, nothing went smoothly, but everything ended well. Our engine recently decided to stop spitting water out of the cooling system exhaust. I’m taking a basic boat and engine maintenance course through the North Vancouver branch of the Canadian Power and Sail Squadron. After I described the problem to him, a marine mechanic who taught part of the course deemed our engine not worth fixing; for the price of repairs, he said, we could replace the whole thing. 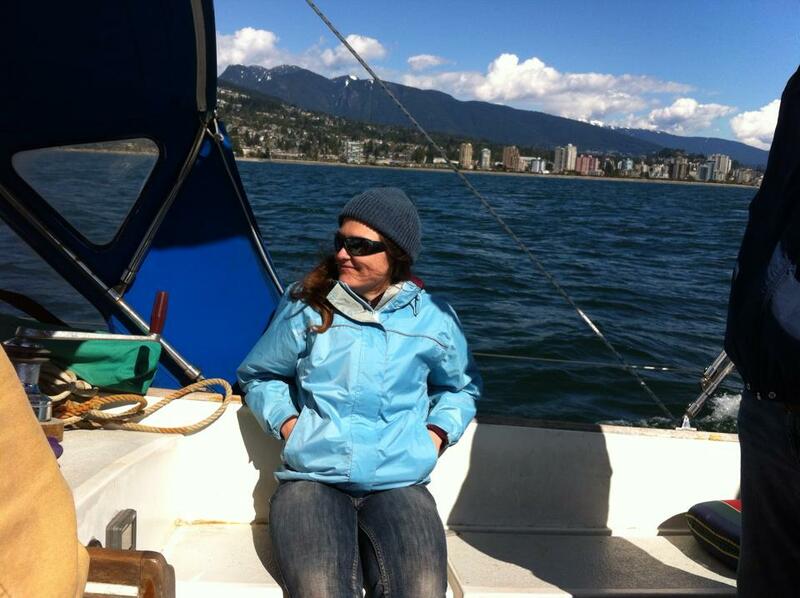 Being optimistic sailor types, we ventured out of False Creek by sail and paddle. At first, the sailing was working fine, but then our bow started pulling us around in circles. Our thought is that the headsail was trimmed for a close haul when it should have been on a run based on the wind direction. After some frantic maneuvering where we seemed to be losing steerage, we pulled out the paddles we’d bought recently. The current was in our favour (we planned it that way), so we rode it out to English Bay. Yes, we got some strange looks and some people asking if we needed help, but we were quite happy to do it that way. Eventually, we got under the bridges and out into the bay, where we popped our sails back up and went for a glorious ride. The winds were picking up, which was both exhilarating and scary. Tomahawk was heeling over pretty far, but I wasn’t sure if that was normal. Jason thought it was and I think he was right. After our joyride, we were planning to anchor in the bay. We had bought an extra length of heavy chain, so as to avoid a repeat of last fall. No more groundings for us, please! However, we hadn’t rigged up the new chain to the old rode, or even figured out exactly how we were going to set it up. On that day, the current was strong and pushing us out to sea, which was very distracting. Freighters were anchored all around us and we didn’t want to hit one. Also, the wind was getting stronger and stronger and there didn’t appear to be any other boats out – just one crazy windsurfer who seemed to be loving the high winds! To make a long story short, we had no steerage and ended up dropping our sails to keep ourselves from moving too fast into a freighter. Without a working engine, it had become impossible to get into the anchorage and we ended up getting a tow from the Coast Guard. They were friendly and helpful and left us at the Granville Docks. 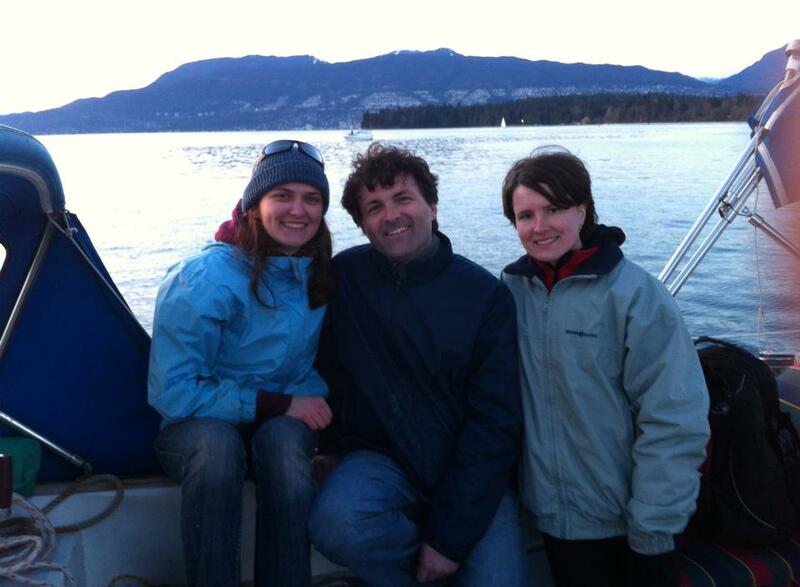 Our friend Jamie towed us the rest of the way into False Creek, where we reanchored pretty much where we were before. We talked to a few people and took stock of our mistakes and what happened. As it turns out, the growth on the bottom of our boat seems to have played a role in loss of steerage. At the same time, apparently it’s just really hard to sail into that anchorage. 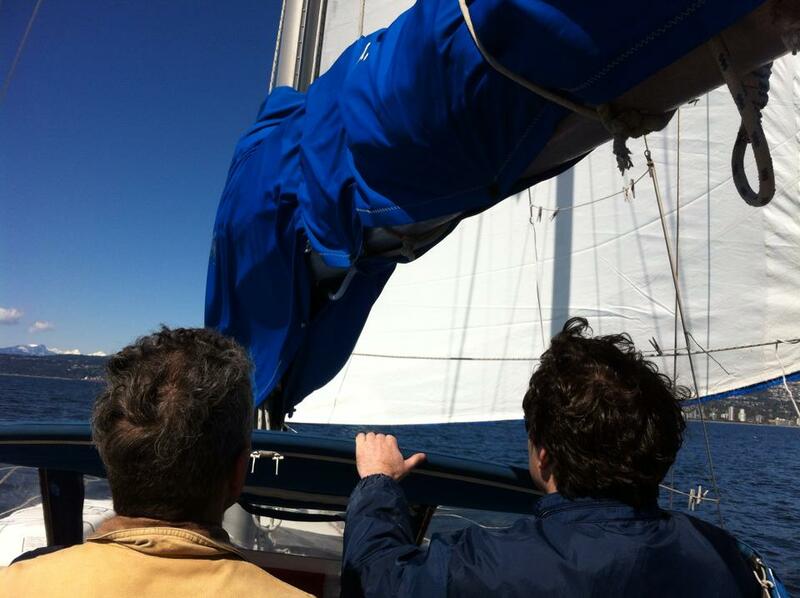 Plus we had the wind coming at us and not enough momentum to tack properly to get to where we wanted to be. It was a great learning experience. Though nerve-racking at the time, it’s a great feeling to be out on your own boat, sailing around. Even when you get stuck out there. The boat is tidier than it’s been in a long time, but don’t get me wrong. It’s far from tidy. We threw out a bagful of crap that the previous owner left on the boat. Evidently, he was of the mindset that you should keep everything, just in case, which is laudable, except that you only have so much space on a boat. To be fair, a lot of the stuff has been sitting doing nothing all winter and probably deteriorated since he decided to keep it. We’ve also replaced our lost paddles (you can read about that adventure here) and bought a kayak cart. It works great, even though we haven’t inflated the tires yet. So we took one of our kayaks home to our balcony and tucked the other inside the boat’s cabin, since we had cleared it out. I told you it wasn’t actually tidy in there. Keeping it in there reduces the risk of theft, though, which has hit home pretty hard recently. I suppose this is true of owning a house, as well. Or even a car, in some cases. Among other things, we stocked up on the required safety equipment for our boat’s size (manual bailer, sound signalling device, fifteen-meter throw rope, etc.). I made a rope ladder by following the instructions in a book about knots that we bought on sale a while ago. We ordered oarlocks to replace the broken one on our dinghy, but when they arrived, they do not fit. We paid twice as much on shipping and customs as for the oarlocks themselves, which is a bit off-putting. We are going to try to return them, but we probably won’t get much of our money back. As of now, we are considering ways to rig up straps for a temporary fix. Of course, we also need to buy new oars, since someone thought it worthwhile to take one. Jason is starting a woodworking course soon, so he will try to construct something sturdier once that gets on the go. The day after our adventure with the kayaks, our friend Jamie took the three of us out on his 43-foot cutter-rigged ketch Paramour. Until that day, I had no idea what those words meant, although I had seen them in some sailing publications and blogs. So just to be clear, a ketch is a sailboat with two masts. A cutter has an inner and outer forestay (thick wires that support the mast and where the foresail clips on). Anyway, it was a beautiful day and he had us do most of the actual sailing. Muna steered while Jason and I were in charge of tacking. Jamie also showed us his autopilot, which I had been curious about since watching Wild Eyes: The Abby Sunderland Story. (It’s on Netflix, if you want to check it out.) I didn’t really understand how a boat could have autopilot. Now I know that it basically takes control of your rudder to keep the boat on a chosen course. The downside is that if the wind shifts, which it does a lot around here due to all the mountains and buildings, the course may no longer be the best one for the current sail trim. So basically, you still have to pay attention, but it is useful for taking a lunch or bathroom break. It also means you don’t have to stand at the wheel all day. We went out farther than we had been so far, past the freighters but still not in fully open waters. Of course, you have to go pretty far to get to open waters around here, what with the Gulf Islands in the way. That’s a good thing for newbies like us though! Paramour at sunset. The wake in the foreground is from the dinghy we are sitting in.